Nowadays the expression has fallen out of use. I can’t remember anyone I know ever using it in conversation and I imagine that it’s gone the way of countless other rural sayings that don’t fit with our twenty first century world. The expression derives, though, from a peculiar and entertaining annual event. In spring hares transform from shy, elusive animals into something quite different. In late March in particular you can see them out in the early mornings darting around the meadows with incredible energy and, if you’re lucky, you can watch a pair of them up on their hind legs, having mini boxing matches. This strange behaviour is explained in this BBC video, which is well worth a watch. It depicts a day in the life of a Jill (female) hare in the Norfolk countryside. It explains how the fighting is a behavioural device used by the females to choose a strong mate. It’s a fascinating spectacle and it is one George Orwell was familiar with. In his Bad Climates are Best piece he lists ‘hares boxing in the young corn’ as one of his associations for March. In another of his essays, Some Thoughts on the Common Toad, he mentions the hares again. The fact that he mentions the hares twice in his journalism in the space of a few months underlines how strongly the behaviour caught his imagination. You wonder whether something as simple as this – the spectacle of one hare bashing another in the corn fields– might even have been the catalyst for a work like Animal Farm, with the animals’ battles symbolic of so much more. In any case I had to try and get a photograph of the boxing hares for my project and from the start I knew it would be difficult. Asking about I found out that the hare population is not evenly distributed throughout the countryside but rather concentrated in big clumps here and there. Two different people told me that most of Hertfordshire’s hares live around Baldock in the north of the county, which, tellingly, is just two miles from Wallington where Orwell spent so much time in the 1930s. Not having a car I found it difficult to get to Baldock and instead I decided to try my luck back in Staffordshire during my Easter visit. My dad had told me that he’d seen some hares fighting in the fields at dawn while talking our collie on her morning walk. These were the ones I set out to find. The shot I managed is the one at the top of here. It’s by far the worst photograph of this whole project so far, but in many ways it was the most enjoyable one to get and I don’t think, with the kit that I had, that I could have done any better. It was before dawn, about five o’clock, on the 30 March. The whole area had been carpeted in a fine snow that had stuck around for a week and had been blown up into great drifts by the hedgerows. By the time the sun rose over Bagot’s Wood I was down in the fields, crunching through the snow. It was a clear, chilly morning. The snow had captured the starred prints of pheasants. Other birds were flying noisily to and fro overhead on their errands and white light was reflected up from the ground, brightening up everything for photography. I’d just taken one lens out with me that morning, a 200mm fixed manual lens that I hoped would let me get a quick long shot of any wildlife. I took a photo of a goose flying towards a local reservoir and a few bare trees on the far side of a valley. And then down in a little vale I found the prints of what I thought might be a hare – long, narrow and rounded at the ends. And there they were. 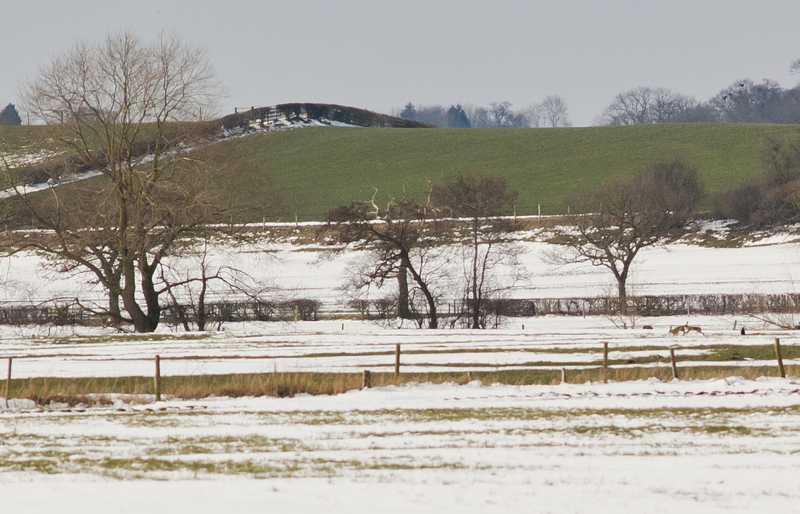 Around a hundred metres away, across a hedge into an adjoining field, three hares were darting across the snow. Then they stopped. Two of them rose up on their hind legs and started to fight. I was far too far away to get a close up, but I took what I could and then started towards them. But as I did they turned and sped – hares can run at 45mph if they need to – into another field. This game carried on for quarter of an hour or so. I’d get to a certain critical distance, just about able to watch them chase and fight, before they’d turn and whip away. It was half exhilaration half frustration. Eventually they decided the quit the area completely and I had to watch as all three of them ran up the far side of a valley – two of them seemingly in pursuit of the other. In retrospect I realise that to get a fantastic close up of the hares boxing I’d have needed to either use a much longer lens (perhaps 400/500mm) or set up a hide and camp out overnight. But much as I am enjoying this project, that level of dedication is too much. I’m happy enough to have seen some Mad March Hares boxing in the meadows. Catching them at all was lucky and even though my photos don’t convey the experience I don’t feel it matters too much. More importantly, it’s a new vibrant spectacle in the English countryside that I’ve had the good fortune to see. More places to see Mad March Hares.